So... when I said that an Englishman can never have too many hats, I wasn't kidding. This is just a fly-by to show off Microboy's latest, using the same free pattern that I published last week. I thought he could do with some hot colours this time... and I love the fact that I can have such a thought, and a few hours later the hat is finished. Instant gratification! 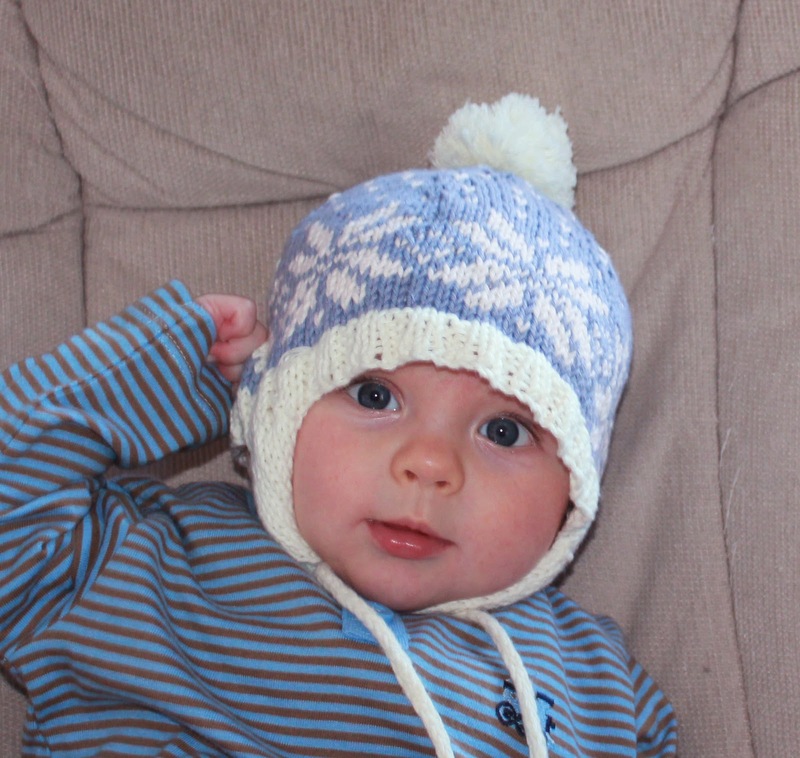 (The sharp-eyed amongst you might spot that his hat matches the cardie that was made for him by my talented knitty friend Maxine). (Full details and pattern link here on Ravelry). Some of you may be relieved that I'm not going on about soap and candles today... it's time for a return to knitting! This is just a quickie to share Part 2 of my Knitted Menagerie... or, in other words, three more random knitted creatures that I have been making for the baby that is due next week. I blogged the first three animals here (Frog, Owl and Bunny) and now it is time to introduce Pig, Bear and Caterpillar. These have mainly been a way to keep my mind and fingers busy in the last couple of weeks, on days when my body has been too achey and inflated to move. 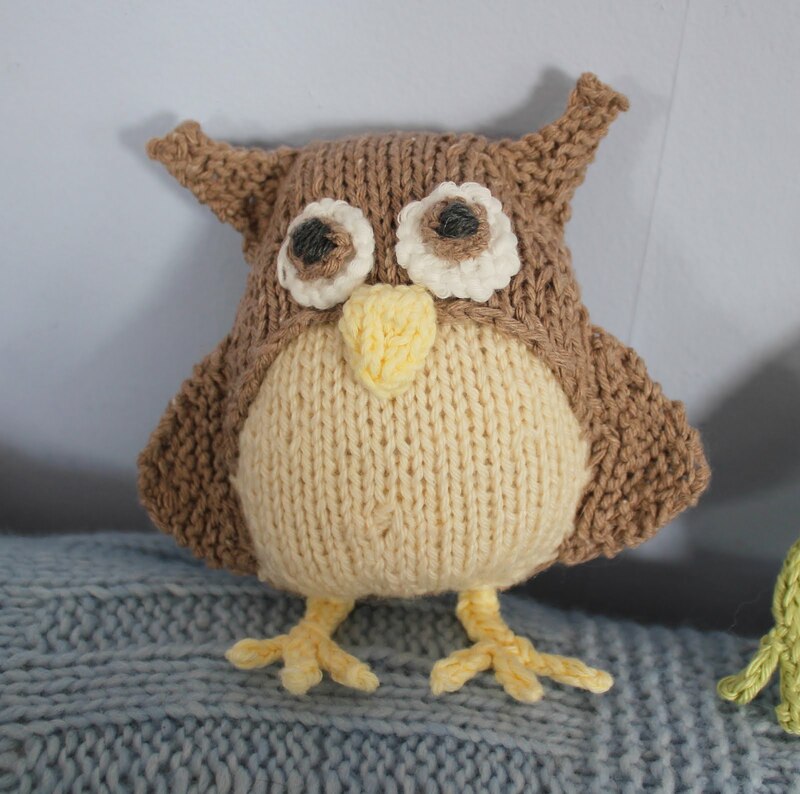 The caterpillar and the bear are adapted from a range of excellent little patterns that I found on Ravelry, by Sarah Gasson, aka Knitables. She has designed a whole range of small animal patterns which are very nicely priced and easy to follow. I made a few adaptations of my own, the main change being to knit everything in the round, and to convert the bear from a finger puppet into a stuffed toy - (e.g. I improvised his lower body and gave him arms and legs adapted from a lion pattern by the same designer). 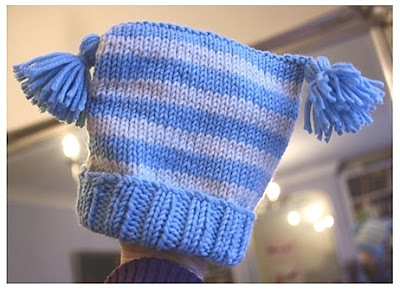 As with the first three animals, the pig was adapted from this book of knitted egg cosies by Susie Johns. Again I had to improvise the lower body and legs, and also dressed him in a t-shirt, as is my whim. When I started this gang of six critters, I was planning to turn them into a dangly cot mobile. But I'm now wondering if they may be a little on the large size for a mobile and might actually be nicer as hands-on toys to be played with. 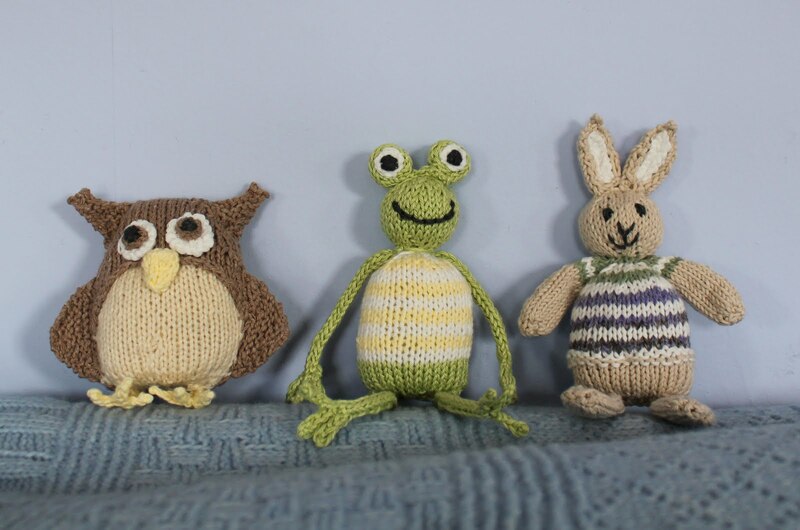 In fact, a couple of friends have already begun to think up adventure stories for Frog and Owl... (and I suspect I might add to the menagerie over time, especially now that I've discovered Sarah Gasson's patterns). As a break from knitting, I'm using this post to share a recipe and tutorial for a really nice home spa scrub/bath soak that I've been playing with, which is very easy to make at home and is a great way to pamper yourself. ...or perhaps someone has given you a bar of lovely soap, but you have very sensitive skin and you're just not 100% sure about using it on your face or body. This recipe solves either of these problems, by combining the finely grated soap with oatmeal, creating a very mild skincare product that can be customised to your skin type and used in a variety of different ways. Mixed with honey, the mixture can become a deep cleansing and antibacterial facial scrub. Alternatively, encased in muslin, it can become a very mild skin-softening bath sachet, which doubles up as a face & body wash. Step 1 - Using a food processor, grind your oatmeal down to a fine grain. The most economical option is to buy regular rolled oats from the supermarket and blitz them in the processor until they reach a texture similar to wholemeal flour. (Alternatively you can sometimes find oatmeal in finely ground form - e.g it is often sold as 'Colloidal Oatmeal' in health food shops). Step 2 - Grate your soap cuttings until you have a a pile of fine gratings, at whatever quantity you choose. At this stage, you may also choose to add some extra drops of essential oil to the mixture... e.g. if you're using unscented soap, or a very low ratio of soap:oatmeal. Given that this is a skincare product, I'd strongly suggest that you avoid artificial fragrances and go for pure essential oils that are known to have beneficial properties for your skin type. Combine and shake the mixture thoroughly, until you can see that it is perfectly combined, then decant into a jar for storage. At this stage, the mixture is ready for use as a honey facial scrub (see instructions below) or could even be scattered loosely into a bath, if desired, to scent and soften the water. Step 4 (optional) - If you'd like to package the mixture up as bath sachets or body scrubs... cut out a circle of muslin, approx 7" in diameter, and place a pile of the mixture in the middle. (If you're a true perfectionist you could go so far as to hem the muslin or use pinking shears to avoid fraying). Tie up the muslin tightly with string or ribbon, until you have a securely filled sachet - and voila! Wet your face with warm water. Now take about a teaspoon of the powder into the palm of your hand and drizzle on just enough runny honey to form a thick paste. Massage the paste into your face, allowing it to exfoliate the skin gently. As long as the oatmeal has been ground thoroughly it will not feel harsh or 'scrubby', but very gentle. If desired, leave the paste on a for a few minutes as a mask (e.g. while soaking in the bath) and then rinse off thoroughly when ready. The next time you take a bath, try dangling the sachet under the taps while the water runs through it, or alternatively drop the sachet into the bath and swish it around for a while. You should notice the soap and oatmeal infusing through the muslin, scenting and softening the bath water without creating any sludgey mess to clean up afterwards. While you're in the bath or shower you can use the sachet as an all-over face and body wash, simply by soaking it in the water and then rubbing it against your skin. This creates a gentle lather through the muslin, with the softening properties of oatmeal, and you'll get several uses out of each sachet before it needs refilling. 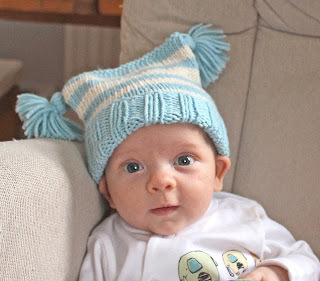 The sharp eyed among you might have noticed that this is not a knitted hat but a crocheted one. There are many patterns on Ravelry for baby owl hats, both knitted and crocheted, but I chose to use this one by Kristi Simpson partly as an excuse to practice my crochet skills. I crochet so sporadically that it's a good exercise for me to have to read a proper pattern every now and then. (And I can vouch that this one is really very simple and easy to follow). Since I stopped work I've been hideously busy trying to prepare the house - and myself - for a new baby boy. But I have managed to find a few hours here and there to make the first few pieces for a knitted menagerie that I plan to dangle over baby’s cot as a mobile. Each animal is around 5-6” tall, including the legs. 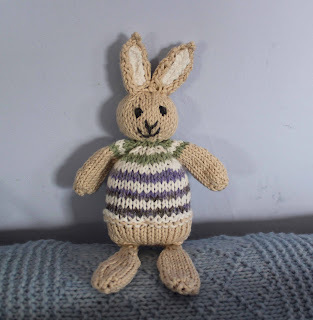 The patterns are more or less adapted from a book of twenty knitted egg cosies by Susie Johns, which I came across in John Lewis. The heads are knitted as per the patterns but the lower bodies and legs have been improvised and stuffed. 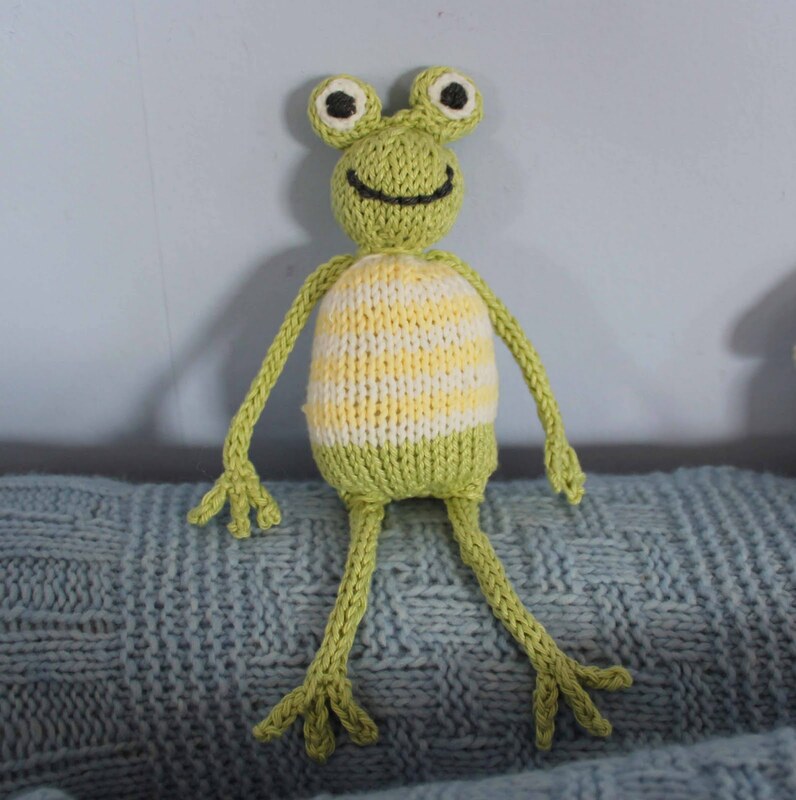 The frog is also quite a cute pattern... the stripey top is my addition, and again, his legs are simply made from icord. For the rabbit, I again added a stripey t-shirt and adapted the legs from the arm instructions. You can't see it here, but I also added a pop-pom bunny tail. I've yet to decide on the animals that will make up the rest of the menagerie... but I suspect it might include a pig and a bear - and maybe an octopus. I've mainly used cotton DK yarns from Sirdar's Simply Recycled range and Freedom Sincere Organic. (But I've also bolstered with a bit of Debbie Bliss Cashmerino here and there where I had a suitable colour available). Full project details are on Ravelry here. All of these were made with base oils of olive, coconut, palm and palm kernel. They also all contain either goats milk or coconut milk and were made using the 'cool technique' described by Anne L Watson in her truly excellent book, Milk Soapmaking. (Seriously, I've become such an Anne Watson convert that I'm on the verge of throwing away all of my other soap books. Although some of them are great for aesthetic inspiration, none of them come close to the simplicity, clarity and common sense of Anne's methods). This is a goats milk soap that I made using all of the leftover vegetable oils I had at the end of a day's soaping, so it ended up having a higher proportion of coconut oil than the others. This is another goats milk soap, made with a crowd-pleasing scent blend of sweet orange, ylang ylang and cinnamon leaf essential oils. I actually discovered this scent blend as part of my essential oil experiments and it was so utterly delightful that I used it for both soap and candles (which I will blog separately). The oatmeal is finely ground and has two purposes - firstly it adds a gentle scrubbiness to the soap; secondly, along with the cinnamon, it will help to anchor the sweet orange scent which is notoriously fugitive and prone to fading over time. (Suffice to say I also used a LOT of essential oil in this batch, to help counteract the risk of fading, which created rather a nice pale orange hue). This is a repeat of my all-time favourite soap, made with lavender, ylang ylang and patchouli. I made this batch mainly to counteract the number of bars that I have given away from the last batch! This scent is beautifully earthy and, to my mind, greater than the sum of its parts. The addition of calendula flowers adds a bit of rich colour to the bars, which are made with coconut milk rather than goats milk. The scent of this soap is so fresh and zingy it practically jumps up and down to be used. This batch is made with goats milk and scented with peppermint and spearmint essential oils. The speckles are the contents of a peppermint tea bag, which tend to turn rust-coloured when you add it to soap. The subtle greenish hue is due to the addition of a couple of teaspoons of French green clay, which adds extra cleansing properties and will also make the lather somewhat creamy. This is a particularly nice soap for men - or anyone who appreciates help waking up in the morning. Finally - I thought I might show off a pair of glass jars that I use for displaying handmade soaps in my bathroom... (I bagged these bargainous items about 6 years ago at a bric-a-brac stall in a village fete).